The way our brains sort and combine information to extract meaning is a huge mystery. The meaning of a word, for example, depends almost entirely on the context in which it is heard and while the English vocabulary is large, the contextual space is very much larger, and fluid as well. The notion that the meaning of a particular word is somehow encoded by a particular network of neurons seems inadequate to the task. So, how is meaning mapped in the brain? No one knows for sure, but some folks at Berkeley have made some tantalizing observations that shed light on the answer and may also translate to even larger questions about our context driven subjective awareness. The meaning of language is represented in regions of the cerebral cortex collectively known as the ‘semantic system’, but how words are mapped onto the semantic system and how this correlates with meaning is largely unknown. The Berkeley researchers used fMRI imaging to determine where brain activity changed as individuals listened for hours to narrative stories from the Moth Radio Hour. 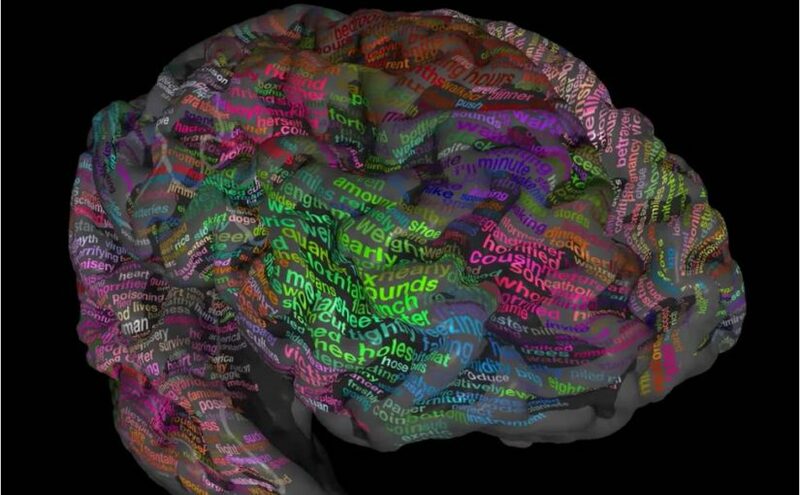 Their results show which specific areas of the brain react to different groups of words. The researchers organized words heard in the stories into groups based on meaning. For example, they created a “numeric” group for number words and a “relationship” group for words like brother, sister, mother, uncle etc. They then divided the brain into small regions, voxels (volumetric pixels), that were observed to activate together when hearing a word. By cross-referencing these two datasets they were able to identify correlations between the meanings of words and the parts of the brain that react to them. One surprising aspect of their results is that the organization of semantically selective brain areas seems to be highly consistent across individuals. The authors interpret the finding this way; “This might suggest that innate anatomical connectivity or cortical cytoarchitecture constrains the organization of high-level semantic representations. It is also possible that this is owing to common life experiences of the subjects, all of whom were raised and educated in Western industrial societies.” The later view suggests a high degree of self-organization, and that is fascinating. The computational methods they used are pretty dense, but you can leave the math to the experts because the message comes across wonderfully well in a video produced by Nature Video. View the video to gain an appreciation for how our brains do remarkable things so effortlessly. The authors also produced a 3D brain viewer that allows you to explore the mapping of meaning in the semantic system for yourself.